As stimulant as the well-loved beverage from where it got its name, Coffee Glaze offers an exquisite touch of warmth that simply makes the heart of your home glowing with a renewed radiance. This premium collection from Craftsmen Network showcases not only a distinct look that creates an utterly welcoming feel to your kitchen but also functionality and durability to match. The subtle yet rich finish can easily bring about a statement in your décor that emanates with a bright personality that is uniquely you. The splendid combination of hand-distressed finish and intense coffee glaze is made more luxurious by the stylish door design of raised panels and extra moldings. 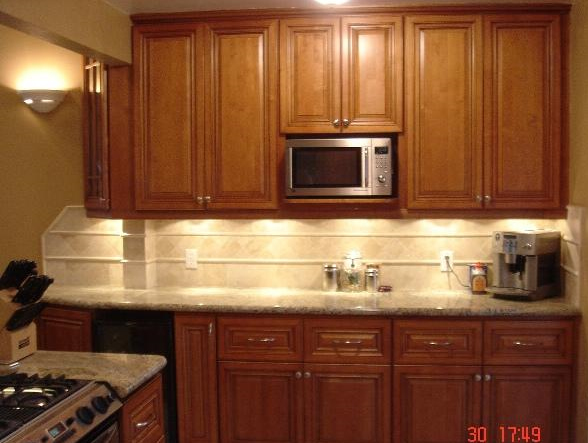 This makes Coffee RTA Cabinets a great choice whether to create a focal point in your design or make your cabinetry beautifully blend in with the rest of the decor. Most often, homeowners spend their remodeling dollars on aesthetics alone. 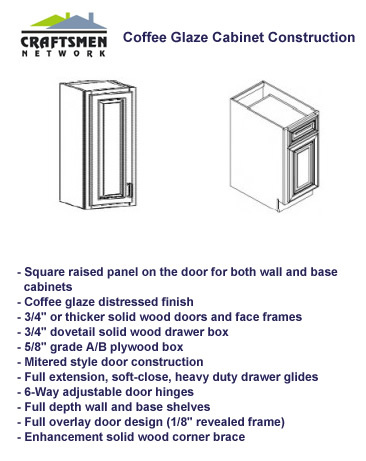 One great thing about buying your Coffee Cabinets from Craftsmen Network is the quality along with beauty that you'll get with every purchase. With all these benefits that come at a very affordable price, you and your kitchen are in for a treat. The luxurious glaze and finish that makes the door designs even more interesting, brandishes an exquisite look and feel perfect for a wide range of kitchen set-ups from traditional to casual. 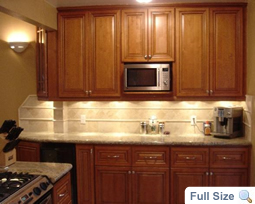 The inherent strength of the wood allows your set of premium cabinetry to grace your kitchens for many years to come. We, at Craftsmen Network, have built our reputation through our consistent commitment to customer satisfaction. From the quality of our RTA cabinets to the very professional yet friendly way we do each and every business transaction, buying your Coffee Cabinets from us would surely prove to be the best deal.